We all love our dogs and wish we could talk to them. Here’s some basic body language and vocal signs that can help dog owners understand what their beloved family member is experiencing at any particular moment. I have often wished my beloved Maltese, Toby, could talk to me in a language I can easily understand. I certainly talk to him as if he somehow knows what I am saying. Toby and I often have what I feel are conversations, such as, “Toby, I will you take out for a walk in just a few minutes — just as soon as I finish folding this laundry,” as he looks at me with wanting eyes. Luckily, there are many resources that allow us dog owners to communicate — or at least understand — the signals our dogs give us. These signals, not surprisingly, take the form of body language and specific sounds and offer significant clues as to what emotional state our dog is in at a particular moment. Please note: These are just a few basic descriptions of common dog behavior and body language. Those who are experts will often discuss much more specific signs of a dog’s behavior, and this article is not intended to replace an expert’s knowledge or opinion. 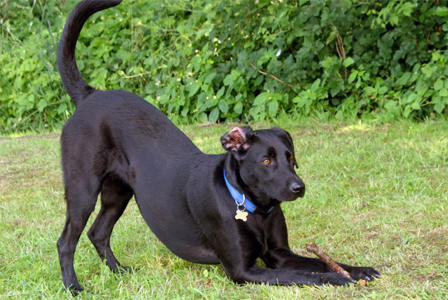 A playful dog usually lets you know with an “invitation to play.” They crouch down on their front paws but leave their behinds in the air — usually with a wagging tail. Modern Dog magazine explains playful dogs “will usually hold this position for only a moment before breaking into a run in some random direction.” Your dog also may bark or playfully growl with either alert or relaxed ears. But how do you know if your dog is being aggressive? Some owners experience aggressive and threatening dogs more than others. Understanding this type of dog body language is likely helpful if you and your pet are around other dogs. There is a clear distinction between what is known as dominant aggressive and fearful and aggressive but both types present a level of danger since attacks are known to happen with each type. Paws Across America notes aggressive dogs sometimes put their ears close to their heads or move them forward, as if in a hyper-alert stage. When a dog is trying to assert dominance, its tail will be straight up and stiff along with snarling and visible teeth. When a dog is aggressive but mainly out of fear — and therefore is not attempting to assert its dominance — the tail will be tucked between its legs, its ears will be back and its fur will be standing up. It is very important to recognize that both forms are dangerous, and the dog may attack if challenged or threatened. What are some of your favorite moments with your dog? Share in the comments below!